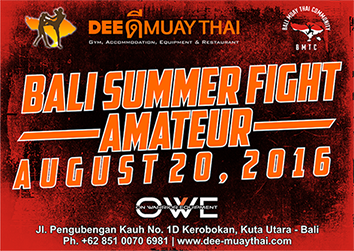 BALI SUMMER FIGHT AMATEUR will be held on Saturday August 20th 2016. Calling all the fighter to join in Training Camp at Dee Muay Thai Center Bali start on August 1st 2016. Sponsorship are welcome to promote your business at our event.